1(a) Define spring back in bending. Explain methods of overcoming spring back. (5 marks) 1(b) Write advantages & limitations of standard mould system. (5 marks) 1(c) What is meant by clearance applied to jigs & fixtures? (5 marks) 1(d) Write the function & requirements of dielectric fluid. (5 marks) 1(e) Differentiate between general purpose machines & special purpose machines. 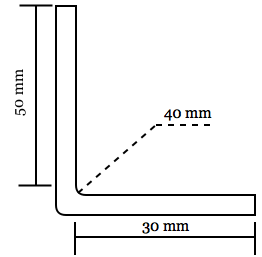 (5 marks) 2(a) Determine length of the part before bending for the component shown in figure. The thickness of the sheet is 2 mm. (6 marks) 2(b) Explain following press working operations.